Since the Off-Payroll rules passed the IR35 compliance burden over to contractor clients and agencies in the public sector, blanket assessments whereby contractors are assessed based on a role have become commonplace. This has resulted in many contractors being unjustifiably taxed as though inside of IR35. The Off-Payroll legislation contains a ‘reasonable care’ requirement. However, its ambiguity has aided HMRC in encouraging many public sector hirers to conduct blanket, or ‘role-based’, assessments that don’t comply with the rules, yet increase tax yield. They do not constitute ‘reasonable care’ – They breach a requirement of the legislation section 61T(6)(c), resulting in the tax risk passing back up to the hirer from the agency (‘fee-payer’). Insurance underwriters will not cover the tax risk unless an individual assessment has been conducted, and agencies do not wish to take on uninsured risk. If investigated by HMRC, an inadequate role-based blanket assessment could trigger an extension of the enquiry window to six years due to ‘carelessness’ under Section S36(1) TMA 1970. If the error was deliberate this could extend to 20 years (S36(1A)). Individual assessments should limit enquiries to only four years. “It’s very easy to recognise a blanket role-based assessment that doesn’t adhere to reasonable care,” comments ContractorCalculator CEO Dave Chaplin. “You ask yourself whether the individual has been assessed. If they haven’t, a proper assessment hasn’t been conducted and the reasonable care requirement therefore hasn’t been met.” The resulting consequences cause a whole host of problems in the supply chain. What constitutes a blanket assessment? Making a full assessment on an individual basis. Where a client assesses a role to predetermine the IR35 status of contractors. To the layman, it is obvious that the absence of an assessment entirely does not adhere to the reasonable care requirement. However, making status determinations based solely on the assessment of a job description or role also falls a long way short of compliant behaviour. Chaplin illustrates this using the example of a hospital recruiting nurses: “A nursing agency provides nurses to various hospitals on an ad-hoc basis. A hospital asks for a grade four nurse, and the agency decides who it will send. Now, imagine an individual nurse who may be considered for the same assignment, yet sources their own work and is in business on their own account. Chaplin explains: “Ultimately, role-based assessments fail to constitute reasonable care because the assessor firstly assesses a role, and then assumes that the set of circumstances identified can be applied directly to anyone who undertakes the job. Chaplin adds that companies are free to place individuals on a payroll, but notes that this would warrant the provision of employment rights; a requirement not asked of hirers of ‘inside IR35’ contractors under Off-Payroll. This adds to the already diminished appeal of ‘inside IR35’ contracting and creates significant difficulties for recruiters. “Under Section 61T(6), the entire tax risk is retained by the client, rather than being passed down to the agency, or ‘fee-payer’. This then builds considerable uninsured risk on the balance sheet of the hiring firm, not only exposing it to huge future risk, but potentially reducing its market value. “It gets worse,” warns Manley. “If HMRC subsequently investigates because reasonable care has not been met, it may argue the hirer has been ‘careless’ in making its assessment. The Off-Payroll rules mean the hirer or agency has considerable tax risk to consider when hiring contractors on an ‘outside IR35’ basis. Failure to conduct balanced assessments which find some contractors to be outside of IR35 will considerably weaken a firm’s competitiveness with regards to sourcing contractors, so this is a necessary risk. Fortunately, it can be insured against, but not if role-based assessments are used. “In simple terms, the actions of one is treated independent of the actions of another, even if the type of action taken is the same,” explains Peter Blackmore, co-founder of Blackmore Borley, insurance providers to freelancers for over 20 years. “If you lived on the same street or drove the same car, it does not mean that the premium for insurance, or the coverage offered, will be the same.The reasons for offering the insurance are fundamentally different. 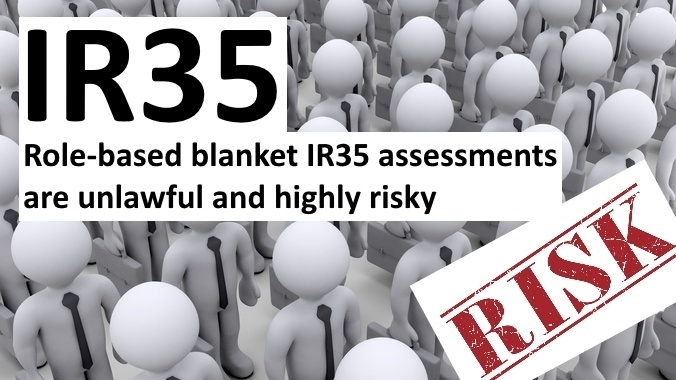 In terms of IR35, someone who has been individually assessed as outside of IR35 could be covered, but someone who uses someone else’s assessment is not. “Each contract needs to be assessed and passed in the name to whom it relates in order to obtain valid insurance. If someone else uses the same contract but does not have a full assessment, then they cannot be insured,” adds Blackmore. The issue of blanket assessments has been reported widely and acknowledged within the public sector. In May 2017, NHS Improvement (NHSI) instructed Trusts that locum staff should be assessed on a case-by-case basis after a judicial review found its use of blanket assessments to be unlawful. Months later, the Independent Health Professionals Association (IHPA) (previously the LDU/HPU) launched further legal action against NHSI after it emerged that Trusts were still being encouraged to assess locums as within IR35. Qdos found 38% of public sector contractors reported being blanket assessed. The taxman has reportedly even acknowledged that status decisions are being made without a proper review of each assignment. HMRC has attempted to downplay the issue, estimating it to be the case roughly 10% of the time. Nonetheless, this is a startling admission given its imminent plans to extend the Off-Payroll rules to the private sector. Despite the overwhelming evidence and HMRC’s own admission, Government continues to deny the problem, with correspondence from the Chancellor of the Exchequer regarding the Off-Payroll rules claims that assessments are being made on a case-by-case basis. “HMRC’s advice could facilitate and incite tax evasion, for which all parties could be prosecuted. If such advice caused an insurer, agency, or other party to suffer loss then there could be a claim for negligence. Allow contractors to appeal an assessment at the point of decision. Unfortunately for contractors, as long as HMRC continues to perceive a heightened tax yield as a result of the rules, Government will likely remain disinterested in making the necessary changes. Chaplin concludes: “The problem is that HMRC is trying to override the law for its own convenience. HMRC is now attempting to cover over the fact that its implementation of the reforms was botched, resulting in widespread unlawful blanket assessments. “The taxman has no powers to instruct organisations to circumvent the legislation by blanket assessing contractors. This is yet another example of it abusing its powers to try and obtain the maximum, rather than fair and correct, amount of tax.